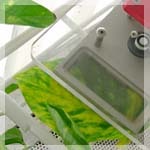 In Laboratory of Bioproduction Systems Engineering , many research projects have been propelled aiming to construct new bio-production systems (an open field production system, a plant factory system, a production system in outer space, and etc.) 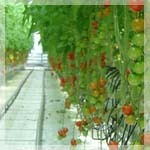 by use of high technologies. Especially, robotics and machine vision are ones of the most important technologies. 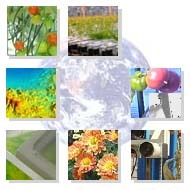 Here, some of the research activities are introduced. Many robots for bio-production have been developed in the world and it is predicted that they will be commercialized in the 21st century, since some of them were already commercialized by some companies in Japan and European countries. 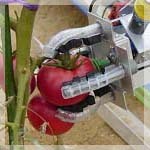 A tomato and cherry tomato harvesting robot, a cucumber harvesting robot, strawberry harvesting robots, a multi-operation robot to work in grapevine yard, and a chrysanthemum cutting sticking robot, which have been developed in our laboratory, are described below.